When I was little, I loved yoga. I practised yoga for many years as a child and teenager. As an adult, this has helped me tremendously with relaxation techniques, in particular. 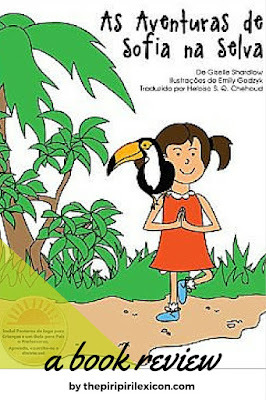 So when I heard about the books written by Giselle Shardlow, from Kids Yoga Stories, to introduce yoga to children through reading while moving, I wanted in. Kids Yoga Stories "integrate yoga, literacy, cultural education, and environmental awareness". What more would you want? The author, Giselle Shardlow, is a yoga instructor and educator passionate about education, happiness and health. I really liked the idea of focusing the stories on travel and discovering new countries. So I thought I would give it a try. 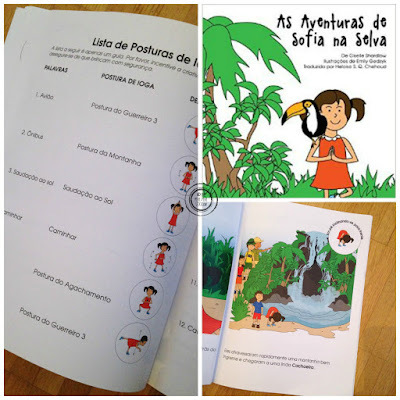 An added bonus for us was that Sophia's Jungle Adventures was available in Portuguese (as well as a number of other languages: Russian, French, Spanish). On our quest for more Portuguese materials, this was perfect. The book is aimed at children from 4-7 years old. The story is that of a little girl called Sophia who travels by plane to the Costa Rica jungle and encounters many animals. On almost every page, a little bubble shows the child a simple yoga position to attempt: the cobra, the toucan, the plane, etc. Once our book arrived, I handed the book over to Papa and off he went reading it to his girl, 5. I walked away as I mostly do when they read in Portuguese or else they chatter in French. From the next room, I heard furniture moving, then laughter and giggles. I took this as a sign for a good book. 10 minutes of Portuguese with giggles. That is not everyday. When I reappeared, LJ, wanted to tell me all about this great book where you can do cool moves. I feigned ignorance and sat comfortably watching (and snapping these pictures) while she flicked through the book again and showed me the moves. 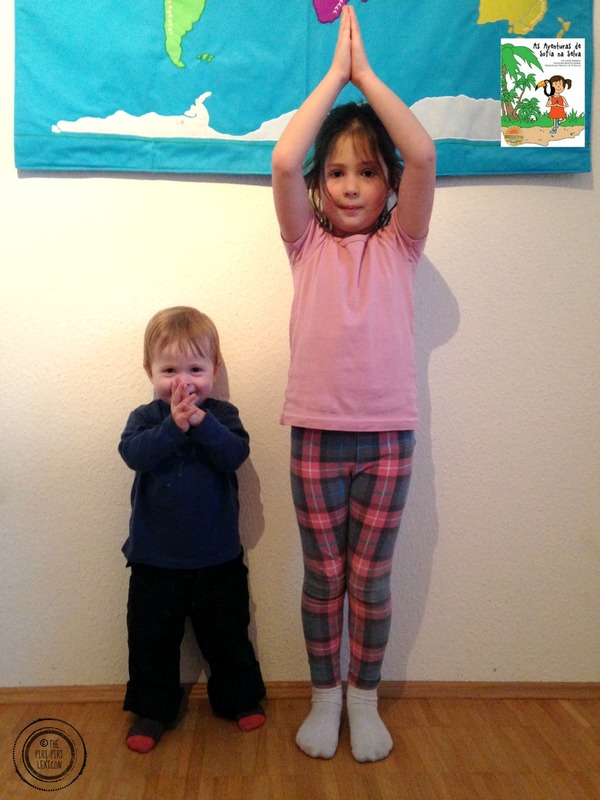 Her little brother (1) joined in too, of course. She explained the animal poses and the movements. She remembered a few new Portuguese words too. Perfect. To this day, she refers to this book as 'the book with the cool moves'. As you may know if you are a regular reader, Papa speaks Portuguese from Portugal. I was a little worried about his take on this book which is in Brazilian Portuguese. But he says that it is fine as there are few words that would be different and also that it kind of goes with the story of jungle and that it could easily take place in the Brazilian Amazon, making it a perfect language-culture fit. 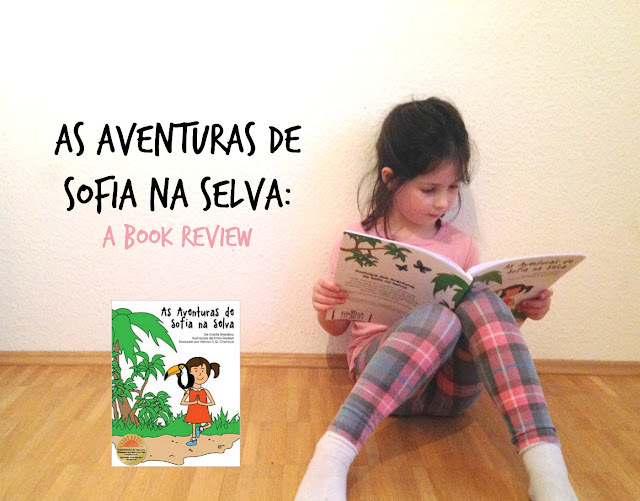 If you are looking for a fun and very simple introduction to yoga, I highly recommend Sophia's Jungle Adventures and its Portuguese version As Aventuras de Sofia na Selva. The illustrations are really cute and the translation is well done (even the spelling of the name of the character is adjusted). 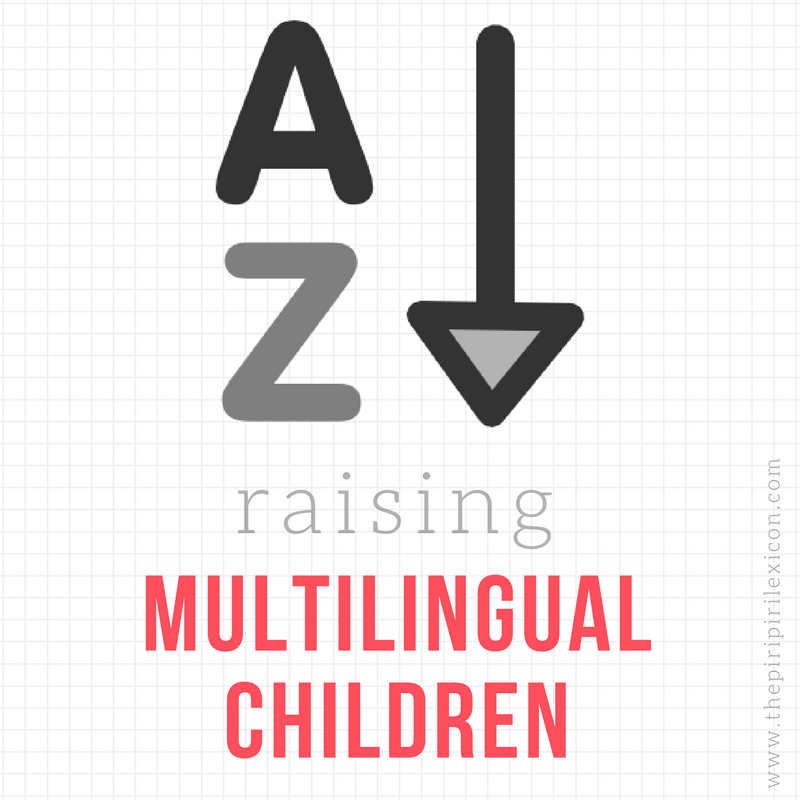 As an added language bonus, this is perfect for bilingual children to pick up a few new words and idioms. I received a free copy of this book for the review but the opinions expressed here are entirely my own.